Fig. 3-3-3-4 shows the number of persons newly placed under probation/parole supervision for Stimulants Control Act violations over the last 20 years. The number has been on a decreasing trend since 2005 with parolees and since 2001 with probationers. 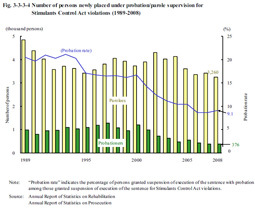 The percentage of probationers among those granted suspension of execution of the sentence for Stimulants Control Act violations was 20.6% in 1989, but had been on a declining trend, and decreased significantly to 9.1% in 2008. Under the categorized treatment system, probationers/parolees classified as “stimulants offenders” or “abusers of paint-thinner, etc.” are provided with effective treatment with a focus on their problems, etc., and seminars are conducted for their guarantors (See (3) of Subsection 2, Section 2, Chapter 5, Part 2). In addition, probationers/parolees for personal use of stimulants who meet certain conditions are obliged to join a “stimulants offender treatment program” as a special condition for probation/parole supervision (See (1) of Subsection 2, Section 2, Chapter 5, Part 2).